Decorations may look nice, but aren't always necessary. Because they don’t require a lot of your time, fish can be the perfect pets for people on the go, and guppies are among the easiest fish to keep. Not only are some types quite beautiful, but they also tend to be hardy and tolerant of a range of conditions. Keep the water temperature around 75 degrees. Use a heater, if needed. Opinions vary among guppy fanciers as to the best temperature for your guppies, but as the water hits around 80 degrees your fish will eat more, and young fish will grow faster, because the warm water boosts their metabolism. Never let the tank get over 85 degrees, because a temperature that's too high can harm your fish. Feed your fish a varied diet. You can use guppy flakes as the foundation of their diet, but offer them some other choices on a regular basis. Guppies enjoy brine shrimp, bloodworms, daphnia and mosquito larvae. Adult guppies can be fed once or twice a day, but growing youngsters do better if you can feed them four or more times a day. Put in as much as they will eat in a few minutes, but no more than that, since you risk fouling the water in the 10-gallon tank if you give them too much food. Change the water in the tank often, replacing about half of the old water with new water each time. Make sure the new water has been treated to remove chlorine, chloramines and heavy metals. If your tank is overcrowded, change the water at least once or twice a week, but with just a few fish you can safely change it once every two weeks. 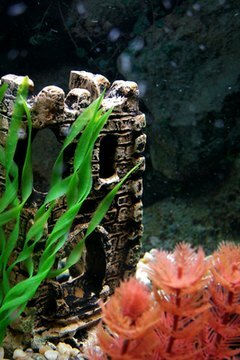 A small corner filter is usually enough for a 10-gallon tank. Replace the filter material when it starts looking a bit brown. Take out nearly all of the old media and toss it, but save a small piece and sandwich it in with the new floss when you refill the filter. This provides a starter culture of beneficial bacteria, which is what biodegrades the ammonia in the water created by the fish waste products. Don’t allow your tank to become overcrowded. A 10-gallon tank can support about 10 inches of fish, based on the rough estimate that a tank can support one inch of fish per gallon of water. With guppies, this comes out to about 5 average-sized fish. While the tank can physically hold more fish than that, having too many fish in the tank will cause them to suffer the effects of overcrowding and the guppies typically will fail to thrive. Guppies don’t need a lot of fancy extras in their tank. They are fine with a plain tank containing nothing more than water and a filter. If you go with the plain tank, paint the outside of the bottom black, so your fish will feel more comfortable. If you plan on raising any guppy babies, they will need lots of cover, including floating plants in which to hide. Otherwise, the adult guppies will eat them. 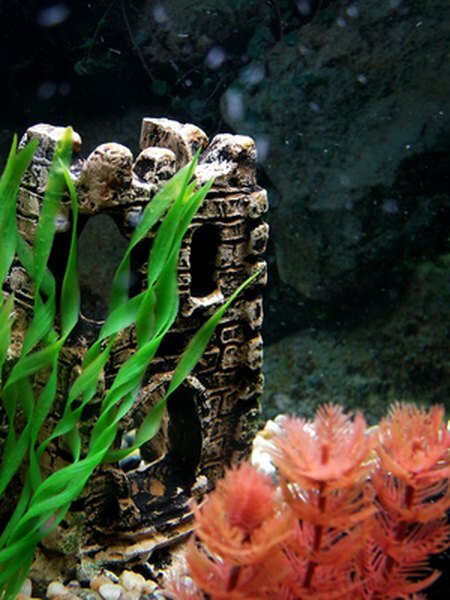 What Kind of Plants & Decorations Do Tetras Like? What Makes a Good Tank Mate for Goldfish?